A colourful design combining stained glass and patchwork has won over Keynsham residents in a vote to decide what the town’s new clocktower should look like. Artist Sebastien Boyesen’s proposal proved most popular among the three shortlisted designs, winning 48 per cent of the public vote. 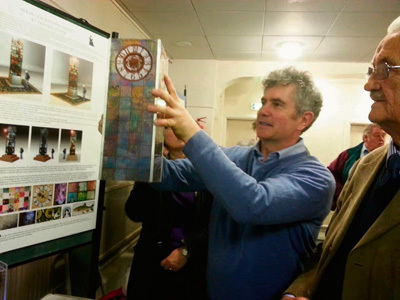 The clock tower will feature glass and acrylic panels incorporating aspects of the town’s history and Mr Boyesen will be working with residents on the details of his design. He said: “What I look forward to most is working with the community, and going on a journey with the creation of the clocktower to see where that might take us. The end result should be a new and treasured landmark in the town that many generations will grow up with. Residents will be able to take part in three “road show” events in July, August and September to shape the clocktower’s final design, where they will be invited to bring photos, stories and images to share with the artist, who will also be meeting with community groups. An example of Mr Boyesen’s work can already be seen in the region as he was previously commissioned to create the colliery wheel installation in Radstock’s Miners’ Memorial Garden. Keynsham town councillor Lisa O’Brien, chair of the Keynsham Arts Advisory Group, which is overseeing the commissioning of public art for the new town centre, said: “Votes were registered both online and via voting slips available at the exhibition, and were rigorously scrutinised to ensure that only Keynsham residents were included. Sebastien won 48 per cent of the total vote with the next design polling 38 per cent, so he was a clear winner. The clocktower is expected to be installed in Keynsham’s new centre by April 2015.